The Tomei Expressway, completed in 1969, links the Tokyo and Nagoya metropolitan areas, passing through Shizuoka Prefecture along the way. It has contributed enormously to economic growth in Japan in its function as the main artery of the country’s transportation system. In recent years, however, it has been chronically plagued by congestion resulting from increased traffic and has suffered from road closures due to accidents and severe weather. In order to ameliorate these problems, planning is underway on a new 330 km long highway called the Shin-Tomei Expressway. In April 2012, the Shizuoka Prefecture section of the Shin-Tomei (162 km) became the first part of the new highway to open. This has bestowed a variety of benefits on the prefecture, providing a boon to the economy and allowing Shizuokans to connect more easily with those from other areas. The high-speed Shinkansen train offers reliable direct connections to Japan’s three major metro areas of Tokyo, Nagoya, and Osaka, as well as service to other cities across the country. Shizuoka features multiple Shinkansen stops, including Atami, Mishima, Shin-Fuji, Shizuoka, Kakegawa, and Hamamatsu. From Shizuoka Station, the Hikari express takes 63 minutes to Tokyo, 58 minutes to Nagoya, and 112 minutes to Osaka. The middle of the three ports located on Suruga Bay is the Port of Shimizu. This port stands out for the convenience of its direct inland access via roads such as the Tomei Expressway and Chubu Odan Expressway, which serve as conduits for goods from both Shizuoka and other prefectures. Shimizu has developed into an international trade port and currently handles the seventh highest number of cargo containers in the country; its role as a gateway to the sea provides a vital contribution to the economies of both Shizuoka and Japan. The splendorous sight of the port seemingly being embraced by Mount Fuji has led it to be called one of the three most beautiful ports of Japan, and in recent years it has attracted a rapidly growing number of cruise ships from abroad. The other two ports on Suruga Bay also play important roles in supporting their local economies. 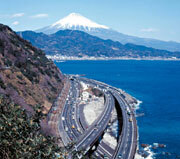 To the east of Shimizu is the Port of Tagonoura, the closest of the three ports to Mount Fuji. It acts as a center for bulk cargo, making it a major contributor to the economy of eastern Shizuoka. The westernmost of the three ports, the Port of Omaezaki, is situated on a cape that juts out into the entrance of Suruga Bay. As the main port serving western Shizuoka, the types of cargo handled here reflect the special attributes of the surrounding area’s economy. Vessels in operation include container ships, car carriers, and RORO (roll-on/roll-off) ships. Mount Fuji Shizuoka Airport offers domestic flights to four cities (Sapporo, Fukuoka, Kagoshima, and Okinawa) as well as international flights to Korea, China and Taiwan, including numerous charter flights. Passengers coming by car can reach Mount Fuji Shizuoka Airport in approximately forty minutes from Shizuoka City and about fifty minutes from Hamamatsu. Convenient airport buses from JR Shizuoka Station, JR Shimada Station, and other areas are also available. As the closest airport to Mount Fuji, Shizuoka’s airport offers stunning views of the iconic peak during takeoff and landing.